Need something quick yet delicious? 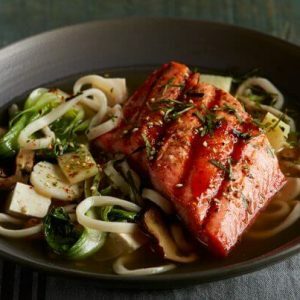 This little gem of a recipe combines tons of flavor with the heart healthy nutrients of Alaskan Salmon. You won't be disappointed! 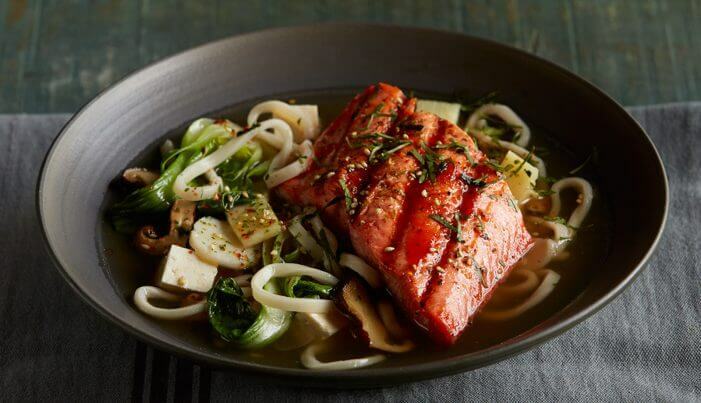 Brush each side of the chosen Alaska fish with the honey sriracha. In a sauce pot add 6 ozs. cooked udon and 12 ozs. of the broth, along with 4 pieces of the bok choy, split in half lengthwise and 2 shitake mushroom, sliced thin. Garnish with 1 tsp. of chopped cilantro and drizzle ½ tsp. sesame oil. Serve.